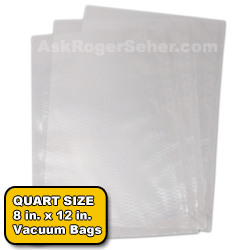 Bulk Discount vacuum sealer bags that work with most discount-store Vacuum sealers. Also works well with many other brands of vacuum sealer brands including "FoodSaver" TM Type Clamp Machines (called external type vacuum sealers), Deni, Black & Decker, Vacuseal, Vacmaster, Tilia, Cabelas, etc. This page took 1.395432 seconds to load.